Mystery Photo No 21 was supplied by Ken Vote (from a Bomber Brown photo). It showed a group of clean-cut young men (amazing what photography will do!) 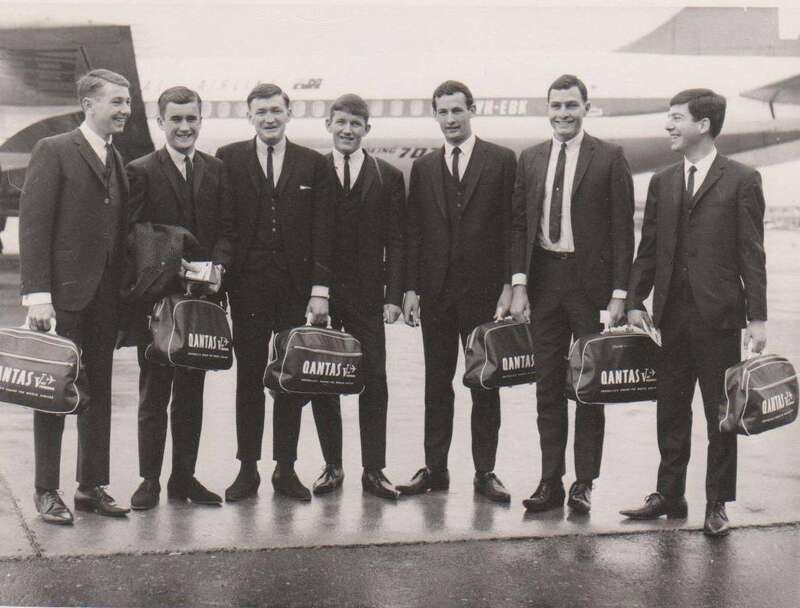 in skinny ties and short trousers advertising Qantas as they await the departure of the Boeing 707 behind them. The names of those in it, from left to right. The photo was taken on the tarmac at Mascot on 26 August 1966 and shows a group of seven Midshipmen who, having completed Flight Grading in Australia, were being sent to Pensacola (Florida, USA) for basic fixed wing and helicopter flying training. Overseas training was necessary as the FAA was about to buy new aircraft and the RAAF were unable to take the larger numbers of students required. Names from left to right are: Peter James; Peter Ey (deceased); Blue Goodson; Lyal O’Donoghue; Mike MacAuley; Ken Vote and Tom Supple. One reader (Phil Thompson) answered the first question correctly and got six of the seven names correct. There was an eighth member of the group: a GL LEUT by the name of John ‘Flappers” Clarke, who was sitting in the 707 doubtless wondering where the others were. A story of John appeared on page 1&2 of a 1967 Navy news, which can be seen here.